If you have a pond or water garden you know that it can add beauty to your landscape design; but to maintain its health and beauty, you will need a water garden aerator. Whether you have a small water garden or a large pond, you will find that aeration is important. The following article will explain how a water garden aerator works and where you can find one that fits your needs. Aeration is the process where oxygen is allowed through the surface of the pond and into the water. The circulation of air into the water also allows for the release of carbon dioxide. Even though one of your fall garden tasks is to clean dead leaves from your pond, some fall to the bottom and begin to decay. Carbon dioxide is the waste material released by beneficial bacteria as it consumes decaying organic materials in the water like those leaves or small sticks. Perhaps the most notable benefit of aeration in your water garden is the reduction of unsightly algae growth. Algae growth is controlled because aeration makes it difficult for the algae to stay at the top of the water where it can feed itself through photosynthesis. Sun is the essential component in the process of photosynthesis. When you provide aeration in your water garden, the algae is pushed deeper into the water where the sun's rays cannot penetrate; without sunlight the algae will die. While this may be bad news for algae, it is wonderful news for you if you want to avoid a pea-green water garden. There are many types of aerators available today including surface and bottom systems in several different sizes. With so many types of aeration systems, how do you know what kind of water garden aerator you need for your water garden? This will depend on the size of your water garden.For ponds less than four feet deep a surface system, like a water fountain, should provide adequate aeration. For larger ponds a bottom system will be necessary to provide proper aeration. A bottom system will allow oxygen to penetrate deeper into your water garden, keeping it healthy and beautiful. Absolute Aquatics has a nice selection of aeration systems and supplies. Not only can you find what you need for your water garden here, but you can also get answers to any questions that you have about maintaining the health of your water garden. Aeration Technologies has aeration systems for water gardens, ponds and lakes. Big or small, they can meet your needs. 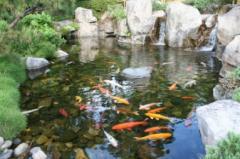 Keystone Hatcheries offers one stop shopping for all of your water garden needs. After you pick out your aeration system, browse the site for other water garden supplies, plants, and even Koi. You may decide that you need to expand your water garden after browsing this site. Pond Liner.com has an impressive selection of aerators and fountains for your water garden, and you'll enjoy browsing their other products as well. Check out the disappearing waterfall kits! There are many more online merchants as well as local sources to find a water garden aerator that meets your needs. 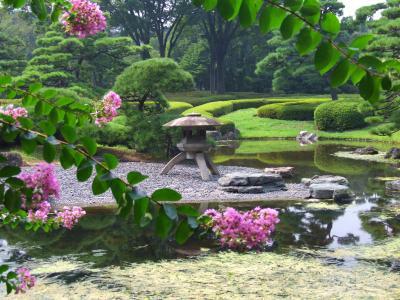 Additionally, many garden nurseries carry water garden and pond supplies. Some will even offer a professional consultation to help you design the right system for your water garden or pond. Whatever way you choose, it will be well worth the effort to have a healthy water garden to provide years of beauty, relaxation and enjoyment.